Mesalands Community College provides a friendly bookstore for the convenience of students, faculty, staff and the greater community in a pleasant and relaxing atmosphere. The goal of the Bookstore is to provide the necessary and supplementary educational materials needed to enhance learning. The Bookstore observes extended hours during enrollment, first week of classes and Book Buy Back. The Bookstore follows the same calendar as Mesalands Community College. In addition to a full complement of textbooks, the College Bookstore offers clothing and gift items featuring the Mesalands insignia, everyday gift and breakfast items, coffee, snacks and refreshments, along with school, office, and art supplies. The Bookstore also stocks farrier tools, rodeo and wind energy equipment, and other sundry items. The Bookstore welcomes students and the community to stop by and take advantage of an array of unique offerings. 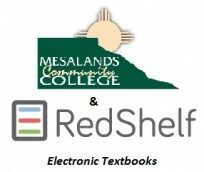 The Mesalands Community College Bookstore has teamed up with RedShelf in order to provide students with access to electronic textbooks (e-books). E-books provide students with simple and affordable access to their course materials, and the partnership with RedShelf links students to the class materials from course Syllabi. The links above will take you directly to the RedShelf Site for Mesalands Community College classes.